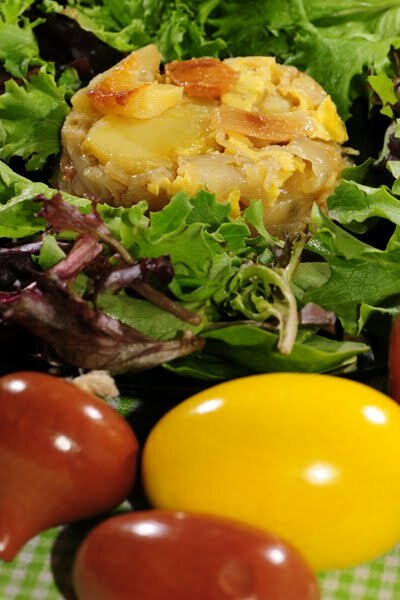 My children don't call it "Tortilla Espanola", they call it "gâteau de pommes de terre" (or potatoes cake) and they love it. They are always intrigued to see me cry and cry some more when I am peeling onions. I had them try pealing onions themselves, so now they know that it's not because I am sad but because onions make you cry. I have always been a little bit jealous at the people who could peel and chop onions without dropping a tear. But, hey, I am crying when I peel shallots or leeks even. Yes, I tried wearing goggles, peeling under water but it did not work! I am used to it : I have a box of tissues handy, I don't answer the phone if it rings, and I make sure to invest in a good waterproof mascara. Otherwise, not only do I pleure comme une Madeleine, I have big read puffy eyes and black make-up all over the face: something to scare my children and husband!! The best thing I like about this dish is that it tastes very good cold, which means that I can make it in advance. I generally serve it in the evening alongside a large green salad. But it would be perfect for brunch or a picnic (as long as you bring plates.) The only thing you want to make sure is that you peel more potatoes than you think you'll need. Otherwise, you'll end up with a 1/2-inch thick layer of potatoes. Nothing like a gâteau de pommes de terre. Bon Appétit! - Potatoes: I generally use two big potatoes per person and add an extra two for the dish. Peeled and sliced. - 2 medium-size onions, sliced. In two large pans, saute the onions and potatoes in a lot of olive oil (a lot : you want about 125ml (4.2 fl oz) cup in each pan. You want to saute the potatoes until they are fully cooked and a little bit brown (but still soft on the outside). This can take 20 minutes. Add salt and pepper. Stack the cooked potatoes and onions in a dish that goes into the oven (a cast-iron skillet is perfect!). The smaller the pan, the thicker the Tortilla. If you want to make it fancier, you could add red hot pepper, green onions, asparagus, etc. You could add more eggs to make it "stick together" a little bit better but I don't like it with too many eggs. I made individual ones for the blog but I generally make only one Tortilla in a pan. And so are the cupboards and the food left on the countertop in our kitchen if you are a child, a pre-teen or a teenager and don't ask for permission. So don't even think about helping yourself, especially if I am not around, especially if you had been offered food less than three hours ago, especially if you are going to have lunch/dinner in less than one hour. But, obviously, if you ask for permission, I'll give you something! Enfin peut-être, depending on your excuse! Letting children open the fridge without asking for permission is not something French people do a lot. I have never seen my friends' children or my nephews/nieces do it ; I never open the fridge at my French friends' place unless I have been granted the authorization and it took a a while to feel comfortable opening my in-laws' fridge without asking for permission!! But then again, I don't want to generalize. And if I remember well, there were times, at my parents' place, when my brothers would dive for the chocolate mousse desserts without really asking my mother whether it was OK or not... but they were in their teen-age years and coming back from a long day at school or from playing sports. Not because they were bored or hungry because they had not eaten a proper lunch. It also happened that my mother was not home when we came home from school, which meant that we could fix ourselves our snack. And yes, back then, we'll have more than what my mother would have authorized had she been home. Normal, non? I think that if you teach your children, early enough, that the fridge, the cupboards and any in-between-meals food is off-limits unless they ask for permission, they'll remember and develop better habits as they grow older. At least, that's what I hope. Time will tell for my own family. For the time being, I'll keep my bad cop hat handy! Back in Philadelphia... back to our routine, which, I should not call a routine because it's never the same (and fortunately because I don't like routine; it makes me feel old and out of creative thinking). So what's typical day in hot Philly these days? Please Touch Museum, Smith Memorial Playground, Philadelphia Zoo, Narberth playground or a visit to friends in the morning; a local playground in the afternoon. Because the children are tired after a full morning outside, I have a limited time window to feed the children if I want to avoid any meltdowns, ie, my objective is to minimize time-to-table. I therefore don''t cook much for lunch. If I don't have leftovers, I make up a quick salad (tomatoes-mozzarella-basil is a favorite.) In the evening, well, it depends on how lazy motivated I have been during the day. On a good day, I prep dinner early in the afternoon while my children are getting all their toys out nap. On a average day, I postpone it until dinner time! And what about those weekly menus? Well, when I am on vacation and if it's just "us", then I don't plan meals. When we were in France and had to feed anywhere between 12 and 25 people on a daily basis, we had to have menus!!! I'll resume the weekly menus when my children are back in school... for the time being, it's improvisation with whatever is in the fridge! Among all the produces we purchased at the Farmers's market on Sunday (one of our weekly activities), I could not resist a nice-fresh-looking bunch of Swiss chard. And then I came home and thought: what I am going to do with them? It's not like I could just saute them and serve them as a sidedish to my children. This would be calling for disaster! Because let's be honest, my kids are good eaters but there are still limits to their (and my husband's, I am sure) willingness to chew on a sidedish of Swiss chard!! Validated options in my répertoire: Swiss chard tart or a cold Swiss chard soup? Then, I looked at the clock and since it was already 7pm and I had two hungry creatures invading the kitchen, I decided that I was still going to try to serve sauteed Swiss chard but I was going to hide them among mushrooms and pasta. I used my little helpers to clean and cut the mushrooms while I was taking care of the Swiss chard and pasta. The results? "Comme une lettre à la Poste" : easy-breezy. So next time you go to the Farmers' market (because it's your routine or because you just happen to be passing by one), don't look down at the Swiss chard because you have young children (and a husband) to feed that evening! Bon Appétit! Once cooked, mix in the vegetables. Add creme fraiche, salt and pepper to taste. It does not reheat well so this is best eaten on the same day. 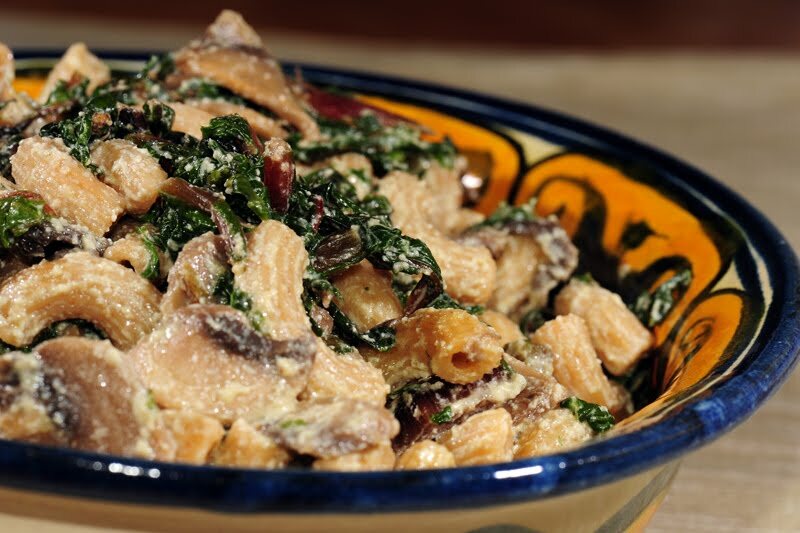 Wholewheat pasta is a plus... but if you are already trying to make your children eat Swiss chard, keep the wholewheat pasta for another day! We are back in Philadelphia. Yes back and sweating!. I had forgotten how hot and humid Summer months can be in this city... That's when we take a walk to the nearby playground to enjoy the water sprinklers!That's when we open our door to make a draft with the freezing cold air of our building long corridor. That's when I do what I consider irrational (it's Summer after all) and take my children to do indoor activities when it's too hot to even breath outside! That's when the only thing I want to cook are icecream and gazpacho (recipe to follow one day). However, yesterday was my daughter's birthday and as a main dish she requested ribs. Ribs that cook for 3 hours in the oven! I know, it was irrational for us to accept to make that dish under current temperatures. But how to say no, especially since it has become one of our favorite "American" meals? (recipe to follow another day). For dessert, my husband had made a Pavlova (recipe to follow another another day) but the children were too tired from jetlag (I did not appreciate the 4 am wake-up call from the children' bedroom) to have dessert. I know, this is irrational too, especially in our family where "un petit dessert" is always welcome. We kept the dessert for today, assuming that they would be able to be up a little bit later since they woke up at only 6 am this morning (it did not feel like a grasse matinée though)! There was plenty of icecream to serve on the Pavlova : I could see that my husband had been alone for a few weeks and had stocked on icecream while we were gone (better than on hard alcohol, non?). However, there was no frozen yogurt because my husband does not like frozen yogurt and never purchases it. I, on the other hand, enjoy a good frozen yogurt. Having made a lot of sorbet, icecream and frozen yogurt lately, I have become quite difficult to please when it comes to icecreams and the likes. This recipe passed my tastebuds test. And my children'. Don't be irrational and trust us on this one, once again. Bon Appétit! Cut the strawberries in small pieces, add sugar (and alcohol) and let them "cook in their juice" for about 2 hours on the stove. Once "cooked", put them in a blender together with the yogurt and lemon juice. Blend until smooth. 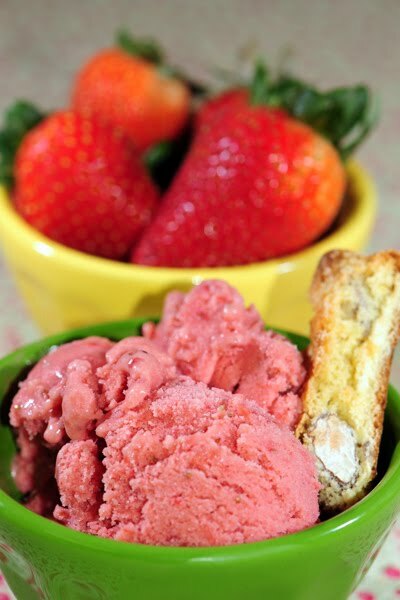 Chill for one hour in the fridge and transfer to your icecream maker. I used frozen strawberries; I used a sieve to get rid of the seeds before blending the coulis with the yogurt. The quality of yogurt is important: chose a good quality one. You could use goat cheese yogurt as well if you like its taste. I grew up eating à la cantine in France (ie, at school) and even though I was not a picky eater there were a few things I did not like and that would make me sick even before eating them. Hachis Parmentier was one of them and it was dramatic (oui, oui, dramatique!!) for me since it was on the menu at least once a month! 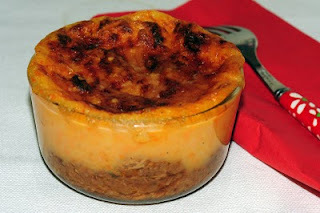 Hachis Parmentier, a mix of ground meat (generally leftover) and potatoes puree, is a pillar of French traditional cuisine. Not the cuisine you'll be served in a top restaurant in France, but rather the one that you cook for your family or for a large group of people (like à la cantine). It took me a long time to be able to eat Hachis Parmentier without gagging (too much school history)... and even longer to cook it myself. I still don't consider it "a real dish" but because it's so easy to make and generally popular among children, I have been cooking it more often. It 's the perfect dish when you ave 10 children age 1-to-12 driving you crazy running around you. I even think that it is a great alternative to the boring traditional pizza that people serve when five children pretend to come and sleep at your place! The good thing about Hachis Parmentier is that you can make your own version depending on the meat leftover you have. In this case, we had Duck confit one evening and I had leftover so I used duck meat. You can also serve it with or without cheese on top (I prefer cheese) and with additional vegetables if you feel like it. What would prevent you from making it this week? Bon Appétit! - Milk or/and light cream. In a large pan, saute the shallots and garlic in olive oil. Add the meat and tomato paste and cook for 10 minutes under low heat. In the meantime, boil the potatoes. Once cooked, drain them. Cook in the oven for 20-30 minutes until cheese is fully grilled. You could add a carrot or a few dices of celery to the meat for extra flavor/veggies or make a sweet potatoes/carrots puree instead of mashed potatoes.